In the early 1970s I went through a back-to-nature phase. My girlfriend and I moved to upstate New York and lived with a friend who cultivated a huge garden. We helped him till and rake and weed and harvest; and we loved all the fresh produce from the garden. The ripe tomatoes off the vine. Corn eaten ten minutes after it was picked. But the greatest thing about the garden was that we were not responsible for it. He was. We just helped out a bit. If we had been in charge, the garden would have been nothing but a patch of weeds. It takes both talent and luck to grow a garden. Gardening is like gambling. When I bought my first home, I put in a vegetable garden. But I didn't have much luck -- although I think my problem was not so much bad luck as not enough work. In the early 2000s, after I got divorced, I lived in a condo, and there was a little patch of dirt out front that I turned into an herb garden. I grew basil, mint, parsley and a few other things. Plus, I had a tub on my deck with a tomato plant. I didn't rake in much, but at least the mint and parsley thrived, and a got a few tomatoes. Now I have the best set-up of all. My bother-in-law lives in Pennsylvania and he's a serious gardener who tills about an acre of corn in his front yard, and grows a variety of other vegetables on another half acre in his back yard. He and his wife have no children. They put up some of their produce, but they give a lot of it away. We visit them two or three times a summer, and come home laden with corn, tomatoes, beans, and lots of other stuff. Last year he even did sweet potatoes. I figure gardening is a lot like gambling. Some people are good at it; they can figure the odds, know how to play their cards. Others, like me, just don't know what they're doing, and our luck arrives when we know people who are flush, and who don't mind spreading it around. Blogger Meryl Baer has taken the gamble to retire to the Jersey Shore, right near Atlantic City. 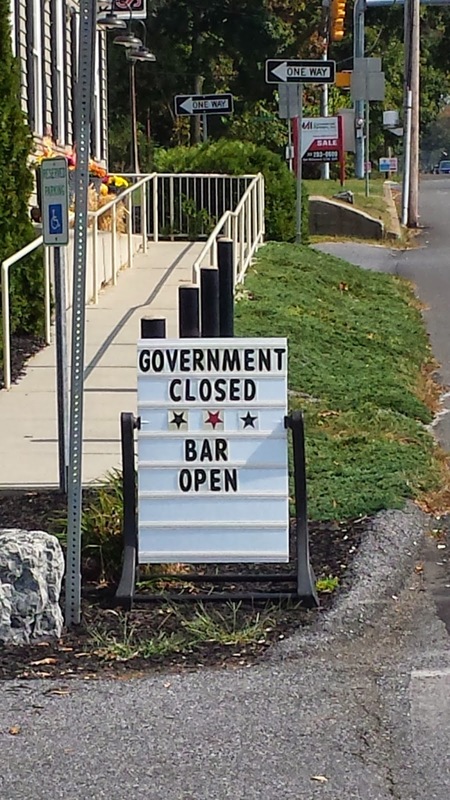 I've read that a couple of the big casinos have shut down. 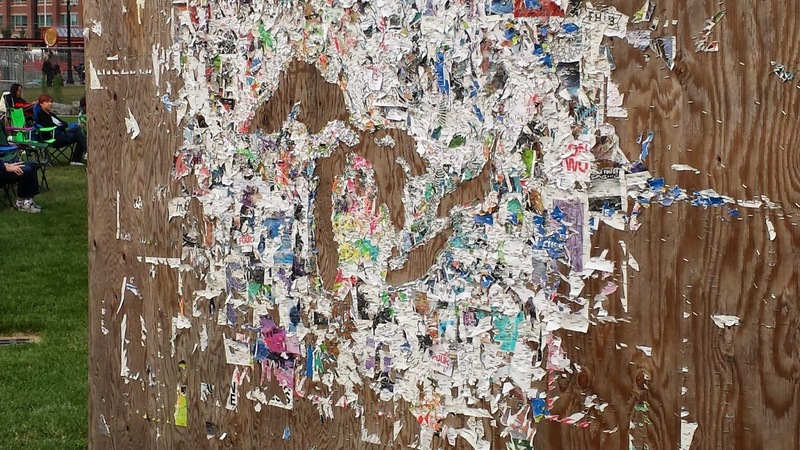 And now Baer has done a post on the city that, she says, is one of the most economically distressed urban areas in the country, a place where current events are a lot more interesting than any fictional story. If you're interested in some urban intrigue stake a claim over at her post A City Way Down on Its Luck. Of course, I know some people who have built their own house. And based on my own experience with contractors, I think building a house is even more of a gamble than growing a garden, or making a trip to Atlantic City. But not so Laura Lee Carter. 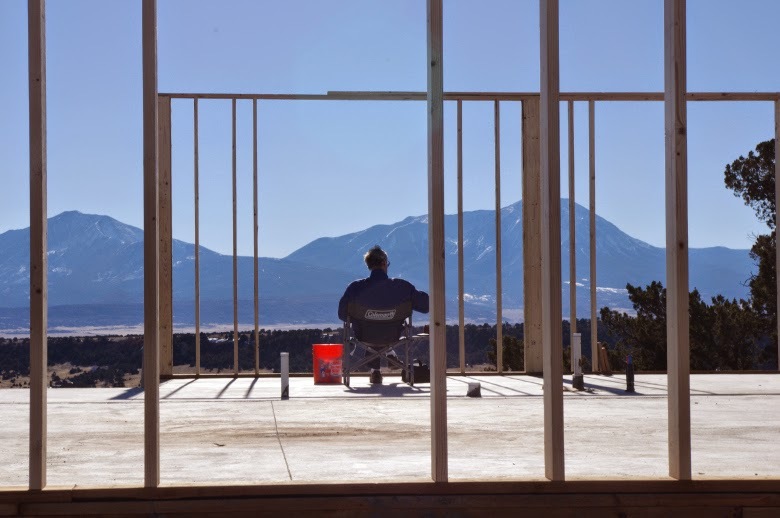 She and her husband have been constructing a new solar home in the outback of Colorado, and her latest post More Progress Up at Our Build Last Week shows that they are making a lot of headway. All I can do is marvel at their courage, and appreciate vicariously the spectacular scenery at their new house. There's another gamble we all take when we pick up our smart phones. This was a big issue a while ago, then seemed to fade, and so I thought it was just a scare. But apparently cellphones do emit at least a small amount of potentially hazardous radiation. On The Survive and Thrive Boomer Guide, Rita R. Robison, consumer journalist, reports on her post Cellphone Cases Make Phones Work Harder that many cases are so badly designed that they partially block the antenna, making the phone work harder to transmit a signal and intensifying the radiation that strikes the user’s head and body. Rita’s article also offers tips on reducing your cellphone radiation exposure. I know my phone case partially blocks the camera lens, so I have to make sure to move it out of the way when I take a picture. It's kind of annoying. But I didn't know the case actually posed a health danger. Personally, the way I deal with the problem is that I don't use my smart phone much. But for those who do, perhaps you should check out Robison's post. And finally, back to gardening. In her post Is Gardening a Simple Cure for What Ails You? blogger Kathy Gottberg of SmartLiving365, remembers her mom working in her garden. It was little more than a rock-and-gravel patch of dirt, yet she managed to harvest a few tomatoes and zucchini in spite of the inhospitable ground. "While I always enjoyed the taste of her fresh vegetables," recalls Gottberg, "my life was far too important and fast-paced to even imagine having the time or interest to garden. But now here I am so many years later, spending time nearly every day nurturing tiny green plants in my care. Though it's taken a while, I've gradually come to realize that many of the hidden benefits my mother harvested went far beyond the obvious. I have come to realize that gardening may just be a cure for what ails many people, as well as the planet itself." After reading Gottberg's elegant words, I wonder if all of us might be better off we if just folded our cards, put down our smart phones, and picked up a hoe or a rake instead. Is the Town Library Outdated? My Internet friend Brad Szollose recently posted the picture below, asking with some astonishment: Did you know you can still get a bachelor's degree in library science? Actually, I did know that. And I know you can still also get a master's degree in library science, because B has her MLS. She went back to school at age 52, got the degree, and now goes to work every day at the library in our community. The fact is, if you want to get hired as a librarian, at least around where I live, you must have an MLS. Her son, a 20-something hipster who works for an Internet marketing company in Brooklyn, NY, thinks along the same lines as Brad (much to his mother's consternation). He thinks libraries are outmoded technology. What do you need a library for when you've got a smartphone in your hand, giving you direct access to most of the world's knowledge? Maybe he has a point ... but not about librarians! And, when somebody pointed out to Brad that there still are plenty of libraries, he responded: Yes, that's true. They still have horses and buggies, too. So with a little help from B, I thought I'd outline what libraries do for us, and why they're still an important part of our communities -- despite the fact that a great deal of the world's knowledge is right there in front of us on the Internet. I know I'll never convince B's son; but maybe I can change Brad's mind. For one thing, you can borrow books from the library. For free. That's a bargain even if you can download the latest $25 bestseller from amazon for only $7. It's true, you might have to put the book "on hold" and wait a few weeks. But at many libraries you can also download the book onto your e-reader. Again, for free. You can also borrow music and movies from the library. Yes, I know they are delivered on those old-fashioned DVDs. But the library has a lot of good movies, classic movies, offbeat indie movies that Netflix doesn't offer. B is a children's librarian. She hosts three different book clubs for kids of different ages. The library also offers a number of other programs. Teenagers read books aloud to young children. Younger children read aloud to dogs -- the idea is that it helps kids develop their reading skills in a completely nonjudgmental atmosphere. The library hosts a sleepover for middle school kids once or twice a year. But of course it's not just kids. People still come to the library to browse the bookshelves, looking for something good to read. They ask librarians for recommendations. People spend time in the periodical room perusing newspapers and magazines. And they still do occasionally come in looking for reference material. There are jigsaw puzzles out on the tables. There are displays featuring various subjects -- Irish history for St. Patrick's day, memoirs about mothers for Mother's Day; thrillers for Halloween. The library features paintings and drawings of local artists in the hallways. And of course there's a bank of computers for the public to use -- if people don't have a computer at home, or their computer is broken, or they need some help, or they just want to get out of the house. The library also offers adult programs, bringing in guest speakers to give lessons in basic computer skills. Other experts offer financial advice, literary insights, historical perspectives. There's a dancing class for seniors once a week. There's an adult book club sponsored by the library -- and the library coordinates with several private book clubs in town to help make books available to people. In fact, about the only people you usually don't see in the library are the 20-somethings. They're too busy getting their lives started. But kids and families and seniors all come into the library. They spend time there, meet other people, strengthen community ties and enrich their own lives. At the risk of being macabre . . . do you ever wonder how you're going to die? I have a friend who's been walking around with a pacemaker for a couple of years. I wonder if he thinks that one day the thing will short out, and he'll just fall over. I've never talked to him about it. People in my family have strong hearts. I don't worry about my heart. But there's a history of cancer in my family. So I figure when my time comes, I'll get cancer and die. Unless I die in a fiery plane crash first. I have a fear of flying, and every time I get strapped into an airplane seat, I imagine I'll going down with the plane, plummeting to earth in a screaming chaos -- although this is pretty unlikely, since I only fly when I have to, once every two or three years. Maybe it will be a car accident. Didn't you ever have a close call with a truck at a busy intersection, or a racecar wannabe on the highway, and think, Oh god, I almost bought the farm. Also, I admit, I am a little bit clumsy. And all my life I've lived with people who are kind of messy, who have a lot of stuff lying around the house. I'm always banging into something, or falling over something, or tripping over a pile of clothes or a piece of furniture that wasn't supposed to be there. I fell in the shower a couple of years ago, pulling the soapdish out of the wall and taking down the shower curtain and shower rod in the process. Not too long before that I tripped over the open door of the dishwasher. I didn't hurt myself. But I had to buy a new dishwasher. Did you know -- when the door of the dishwasher gets broken off, two big metal springs come jetting out at about 80 miles an hour? But here's what happened the other night. B and I like to read in bed before we go to sleep. Actually, she went up early and was asleep by the time I got to the bedroom. I undressed, brushed my teeth, climbed into bed. B had given me a candle for Christmas, and we've been lighting it on these cold winter nights. It smells nice, and seems to make the bedroom just a little warmer. So I sat on the bed, reached for my book and my glasses. Then I remembered the candle. So I picked up the candle with my other hand, fumbled for the matches and tried to light one. But my hands were too full, and I was having a hard time. So I tucked the book under my arm, and struck the match towards me, since that was the only way my arm would go at that point. The match lit up, and a millisecond later a ball of fire flashed up my arm and across my chest. It just exploded in front of me, flying up my arm toward my shoulder. I dropped everything and slapped at the flame. It went out as quickly as it started. I sat there for a minute, stunned. That was close. I almost immolated myself, going out in my own little firestorm. B had slept through the whole thing; and I realized, if the fire had "caught" I might have taken her with me. How could a shirt burst into flames? I changed the shirt because it smelled like it had been scorched. I went into the bathroom and ran some cold water over my arm. I looked for burns, but didn't see any. I came back to bed. My pillow smelled, so I changed the pillowcase. Needless to say, I didn't try to light the candle again. I read for a bit, then went to sleep. I told B all about it the next morning. We looked at my shirt -- actually, it's the top of a set of long underwear. I thought maybe it was made of polyester -- a petroleum product, right? Maybe that would explain the sudden flash of flame. But the shirt was made of cotton. Maybe it has some coating sprayed onto it -- to make it wash-and-wear? I don't know. The shirt still smelled in the morning, and B identified a slight brown patch where it had been singed. We never could explain what happened, really, although I resolved to be more careful in the future. As my mother used to tell me -- never play with matches. And I realized, it's never what we worry about that gets us in the end. It's always something unexpected, something we never thought was coming. What Happens When Social Security Goes Bankrupt? Social Security is a program that's near and dear to our hearts. I think we all know there are some issues with the system. Maybe some of us figure we'll be long gone before Social Security runs into real trouble, so it doesn't really affect us. Others think everything is just okay the way it is, and their only concern is how to squeeze the most money they can out of the system. Still others are sure there's a government conspiracy, or a right-wing conspiracy, or a corporate conspiracy -- or some kind of conspiracy -- to deprive us working men and women of the benefits we've earned and deserve. I don't pretend that my own views can stand up as an authoritative voice on Social Security. So instead, I've gone to my financial consigliere, Jeremy Kisner of Surevest Wealth Management in Phoenix, AZ. He is a Certified Financial Planner and Chartered Retired Plans Specialist, with a degree in economics from UC Santa Barbara. It’s a trick question. Social Security will not go bankrupt. However, if no changes are made to the current system, the “trust fund,” which was built up by collecting more payroll taxes than it paid out, will be depleted. Benefits would need to be reduced at that point to match the payroll taxes being collected. That would happen sometime between 2033 and 2037 if we do nothing. Once the trust fund is depleted, benefits would be cut to approximately 75% of their current level to keep the system solvent through 2087. The reality is this “do nothing” approach is unlikely as there is growing pressure to “fix” the system. 1) Increase payroll taxes. This is the simplest and most effective. The current payroll tax collects 6.2% from employees (and another 6.2% from employers). This would need to be increased to 7.6% to keep Social Security benefits fully paid for another 75 years, according to a study by the National Academy of Social Insurance. It will take some cash out of workers’ pockets, which is never popular and will hurt economic growth. Imagine that…if we put more away for the future, we have less to spend today. 2) Eliminate the cap on taxable earnings. The cap currently limits the 6.2% payroll tax to the first $118,500 of earnings. We could close approximately 70% of the Social Security funding gap if the cap were eliminated entirely. This would only affect about 5% of the workforce, who have wages above $118,500. These people may be a bit perturbed because they already have the worst return on their Social Security contributions. 3) Raise the retirement age. This seems logical since people are living so much longer than they did in 1935 when Social Security began. Unfortunately, this solution is surprisingly ineffective. A three-year increase in the full retirement age from 67 to age 70 for people born after 1960 would only cut the funding gap by 25%. 4) Means-testing for beneficiaries. This would mean that high income retirees would have their benefits reduced or eliminated since presumably they don’t need the benefit. Polls found this option to be highly unpopular with voters who thought it was unfair. The likely scenario is some combination of these options. While Congress is figuring out all of this, I encourage you to save as much as you can. After all, the maximum Social Security you can collect at full retirement age in 2015 is only $2,663 per month and I have a feeling most people reading this article will want to spend more than that. Also, the payroll tax is a regressive tax. If you make minimum wage, it takes 15% from your paycheck. If you make $50,000 a year, it takes 15% from your paycheck. If you make $250,000 a year, it takes about 7% from your paycheck. If you make more than that, it takes even less. So to me, the obvious solution is #2 -- eliminate the cap on taxable earnings, so everyone pays at the same rate. But like I said, I'm no authority. Maybe you have some other ideas. As many of you know, I'm fond of quizzes. (If you don't know, take a look over to the column on the right where you can test yourself on retirement, Baby Boomers, and several other topics.) The idea is that a quiz can offer up some information, and do it in a fun kind of way. This quiz is mostly for fun. The answers are below. So, do you know . . . who is older? 1. Judi Dench or Maggie Smith? 2. Arnold Schwarzenegger or Henry Winkler? 3. Angelina Jolie or Amy Adams? 4. 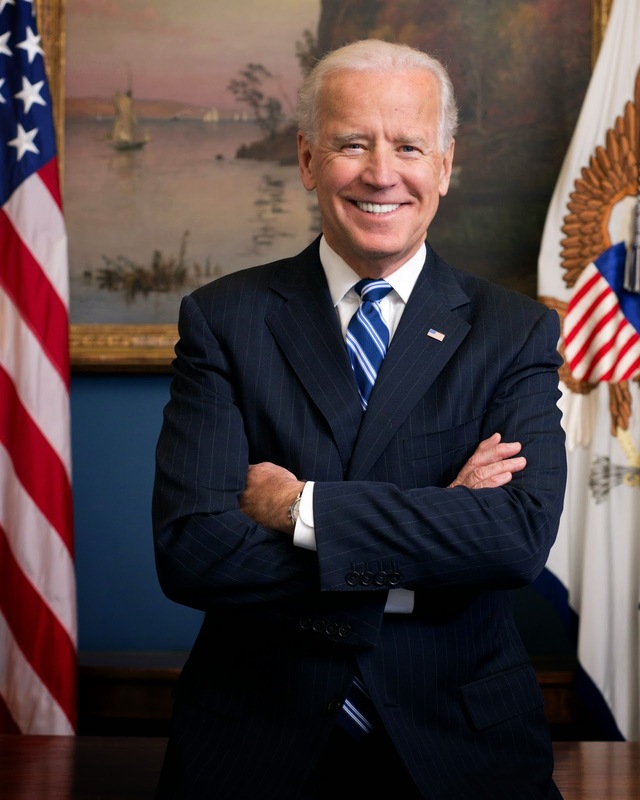 Joe Biden or Joe Pesci? 5. Tiger Woods or Derek Jeter? 6. Hillary Clinton or Jeb Bush? 7. Johnny Depp or Jon Stewart? 8. Sen. Dianne Feinstein or Sen John McCain? 9. Matt Damon or Ben Affleck? 10. Jan of D-Janity or Bob Lowry of Satisfying Retirement? 1. They both star in the Marigold Hotel movies, they're both from England, and they're both the same age. But Judi Dench, born on Dec. 9, 1934, is 19 days older. 2. Henry Winkler, the former Fonz, is 69, two years older than the former Governator. 3. Fresh-faced actress Amy Adams, 40, is actually one year older than the strong-willed Angelina Jolie. 4. Both are 72; but Biden is two months older. 5. Yankee shortstop Derek Jeter is retired at 40; Tiger is struggling through injuries at age 39. 6. Hillary Clinton is 67; Jeb Bush a still wet-behind-the-ears 62. 7. Jon Stewart, at 52, edges out 51-year-old Johnny Depp. 8. Sen. Feinstein, 81, is one of five senators in their 80s. McCain, three years younger, still makes the grade as one of the 23 U. S. Senators over age 70. 9. Matt Damon, 44, from Cambridge, Mass., is two years older than the Berkeley, Calif.-born Ben Affleck. 10. Honestly, I don't know (I'd guess Bob Lowry); but anyway, they're both stars in my book! Well, there is the fact that the snow is melting in my backyard, producing a river raging down my driveway, and scores of lakes and streams that I have to navigate to get from the parking lot into the library. But I wanted to report back about the Finger Lakes. I thought there were five Finger Lakes, like the fingers on your hand. And there are five main lakes: Cayuga Lake is the longest finger, with Ithaca and Cornell University sitting at the base of the lake. Seneca Lake, considered the middle finger, is the deepest lake. Then there is Skaneateles Lake to the east, and Keuka and Canandaigua to the west. But I discovered that there are actually 11 or 12 Finger Lakes, depending on how you count them -- all long, thin lakes running north and south, spread out like fingers across central New York State. The region is known for its wineries and breweries, as well as hiking and fishing and boating. If you really want to know more about the area, including the names of the other six or seven lakes, you can check out the Finger Lakes website. Meanwhile, to answer Dianne's question, the large lake near New Orleans is Lake Pontchartrain. But in fact (I had to look this up, too) Pontchartrain is not technically a lake. It is an estuary connected to the Gulf of Mexico through several other waterways including the Rigolets strait. 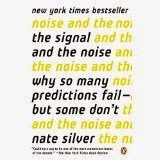 Anyway, speaking of "all wet," I read in Nate Silver's book The Signal and the Noise, that the weather reports you see in the newspaper or on the internet have what he calls a "wet bias," meaning they exaggerate the chance of rain. Why? Because meteorologists know if they say it's not going to rain, and it does, then the audience will get mad at them. But if they forecast rain, and it doesn't rain, then the audience considers this a bonus -- and doesn't blame the forecaster for being wrong. This "wet bias" will typically predict a 20 percent chance of rain when there is really only a 5 - 10 percent chance of rain. But TV weather people are the worst. One study showed that when the TV meteorologists said there was a 100 percent chance of rain, it actually rained less than 70 percent of the time. Still, according to Silver, weather models have actually improved over the years and are pretty accurate, at least with their five-day forecasts. They miss the average daily high temperature three days in advance by an average of only 3.5 degrees. But when forecasts go out eight days, they are virtually useless, and at nine or more days in advance, they are worse than what you would guess just from looking at average seasonal precipitation and temperatures. U. S. forecasters have also made significant improvements in predicting both hurricanes and earthquakes in recent decades. It may not be news to you that your chances of being in an earthquake are higher in Anchorage, San Francisco or Los Angeles, than they are in Miami, Dallas or Houston. But did you know that Charleston, SC, is seismically active? There was a magnitude 7.3 earthquake in 1886, and Charleston is likely to get another earthquake long before there's a significant tremor in Las Vegas, Phoenix or Denver. And finally, largely because of better weather forecasting, it turns out your chances of getting hit by lightning are much less than they used to be. The chance of an American getting hit by lightning in 1940 was about 1 in 400,000. Today, in 2015, it's just one chance in 11 million. Which reminds me of an old golfing joke: What should you do if you're caught out on the golf course during a thunder and lightning storm? Grab your 2 iron and hold it up as high as you can. Why? Because even God can't hit a 2 iron! Please don't ask me any embarrassing questions about why I've never done this before. But over the weekend I finally downloaded the photos from my smartphone -- the ones I've taken over the past couple of years, ever since I first got the phone. That's right, in the over two years since I've owned the phone, I've never bothered to do this . . . even though when I finally decided to figure it out, it took me about 30 seconds. Anyway, the bonus is, the exercise offered me a little trip down Memory Lane. This first photo is from someplace in Florida. Don't remember when, or where. Ft. Lauderdale? 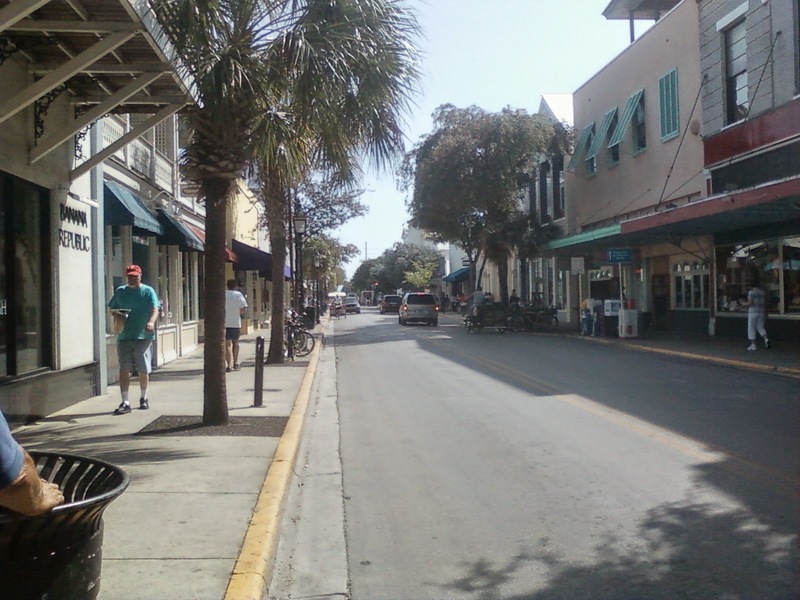 Key West? Naples? Does anyone recognize the street? We were shopping for a new microwave. So this is our new Samsung microwave . 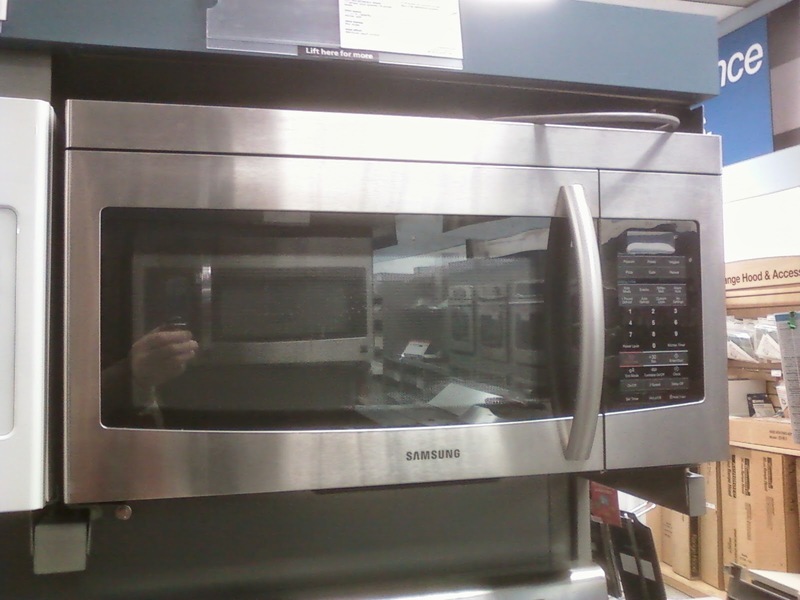 . . or, our new microwave as it looked in the store two years ago. The view from my office window. Obviously, not last week. This was, probably, the summer before last. I posted this photo in Look What I Found! I had lost my camera when vacationing on Cape Cod. B and I looked everywhere for it. The camera finally turned up, about two months later, when I brought the car in to the car wash and they vacuumed the interior. There it is, in my nice clean car! Sure enough, it had been stuck somewhere under a seat. 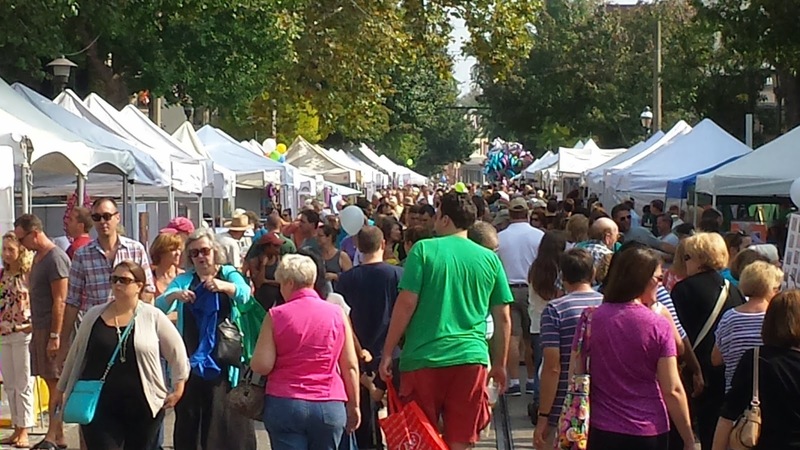 A street scene from the Philadelphia "Fall Into the Arts Festival" in October 2013. B and I went ice skating last winter at Bear Mountain, on the Hudson River. 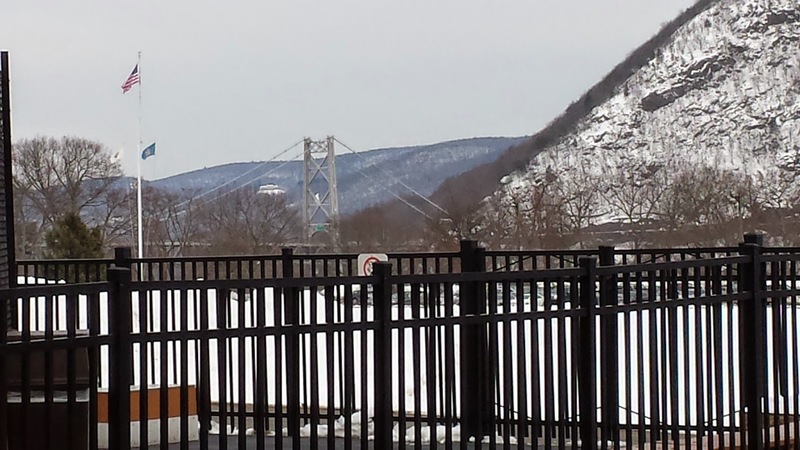 That's the Bear Mountain Bridge in the background. 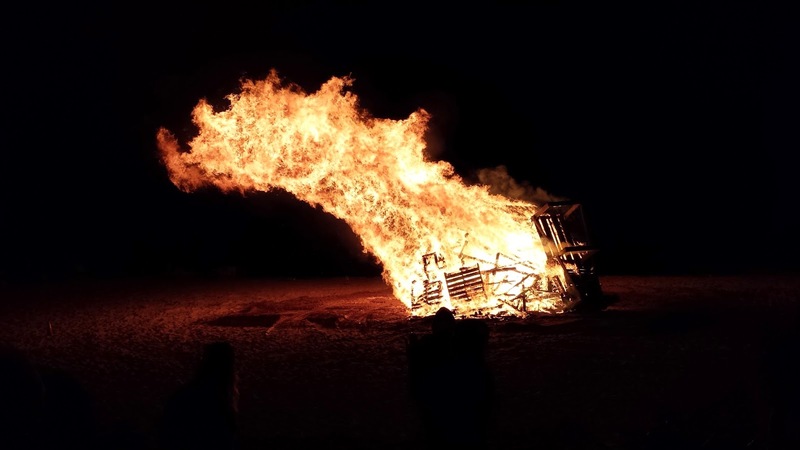 Finally, the end-of-summer bonfire on Nauset Beach, Cape Cod, last September -- a big bonfire to usher in a long, cold winter. But winter is over now. It hit 46 degrees here in New York yesterday afternoon. P.S. The Great Lakes are: Ontario, Erie, Huron, Michigan, Superior. Did you remember them all? If so, here's your advanced-placement question: Name the Finger Lakes in upstate New York. How many can you get? (I'll supply the answer next post, because . . . heck I don't know what they are, I have to look them up!). Americans loved her. But she was actually European, born in Brussels in 1929. Her father was Joseph Victor Anthony Ruston, a British subject who'd come from a section of the Austro-Hungarian Empire that is now the Czech Republic. Her mother was Baroness Ella van Heemstra, a Dutch aristocrat, who's father had been mayor of Arnhem. The family often traveled from Belgium to the Netherlands to England, and because of her international background she learned five languages. During the 1930s her father became a Nazi sympathizer. But her parents got divorced because her mother found her father in bed with the nanny. In 1937 she moved with her mother to England, where she went to a small Catholic school and studied ballet. 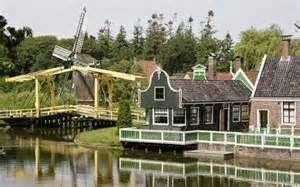 In 1939 they moved back to Arnhem, as her mother thought the Netherlands would avoid the war, as it had during World War I. Instead, the Germans took over, and the young girl adopted her mother's name to blend in with the locals. She suffered from malnutrition, developed anemia and respiratory problems, and as she said later, was horrified as she watched Jews being herded onto trains for deportation. During the war she continued studying ballet. She took part in several secret performances to raise money for the Dutch resistance, and she occasionally served as a courier as well. In the final months of the conflict, as meager food supplies were cut off, she saw people starving in the streets, and resorted to making flour out of tulip bulbs to bake bread and biscuits. After the war she continued her dancing lessons in Amsterdam. But her height and her weak constitution ruled her out as a prima ballerina, so she turned to modeling and acting. She moved in London in 1948 and became a chorus girl. She appeared in several musical revues and landed her first film role -- as a stewardess on an educational travel film. She took small roles in several minor films, until one day, so the story goes, the French author Colette happened to be on set, looking for the right person to play the title character in her Broadway play Gigi. "Voila!" Colette supposedly said. "There's your Gigi." Gigi opened in New York in November 1951, where her name was featured on the marquee. The next year she went on the road with the play, ending up in California, where she did a screen test for Roman Holiday and beat out Elizabeth Taylor for the role of the Italian princess who falls in love with an American newsman played by Gregory Peck. And by now you must know she is Audrey Hepburn, who for her performance was crowned Best Actress at the 1953 Academy Awards. Hepburn went on to become one of Hollywood's most beloved leading actresses -- and who more than once was named most beautiful woman in the world. She was nominated four more times as Best Actress (although she never won again): for Sabrina, opposite Humphrey Bogart and William Holden; for her role as Sister Luke in The Nun's Story; as Holly Golightly in Breakfast at Tiffany's; and as a blind woman in the 1967 thriller Wait Until Dark. 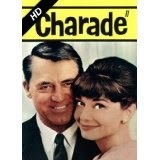 In all she appeared in over two dozen films, including Charade with Cary Grant, Funny Face with Fred Astaire, and My Fair Lady with Rex Harrison. After the 1960s, she scaled back on her acting career, but became almost as well known for her charitable work with UNICEF. In 1993, she was posthumously awarded the Jean Hersholt Academy Award for her contribution to humanity. She was married twice. She suffered several miscarriages but was able to have two children -- one son with her first husband, the actor Mel Ferrer; and a son by her second husband, the Italian psychiatrist Andrea Dotti, who was nine years younger than she was. They eventually got divorced; and Hepburn in her later years partnered up with actor Robert Wolders. Unfortunately, she met an untimely death when she contracted a rare appendecial cancer. She died in January 1993, at age 63, and was buried in a small cemetery overlooking the village of Tolochenaz, Switzerland. European to the end. But if her father's name was Ruston, and her mother's name was van Heemstra, where did the name Hepburn come from? From her father. At one point in England he found the name Hepburn buried in his family tree. He thought it sounded posh, so he doubled-barrelled his name to the more aristocratic-sounding Hepburn-Ruston. After World War II -- when she went by van Heemstra -- she adopted Hepburn as her name. And that answers the question: Was she related to Katharine Hepburn? No, not any more than you and I are. Sometimes in life we end up doing things we never expected we'd do. I never expected to get divorced. I never expected to lose my job. I never expected to be as old as my dad ... and yet I hear his voice coming out of my mouth all the time. The Midlife Crisis Queen never expected to move to a small town in the middle of Colorado. But that's just what she did a little less than a year ago. 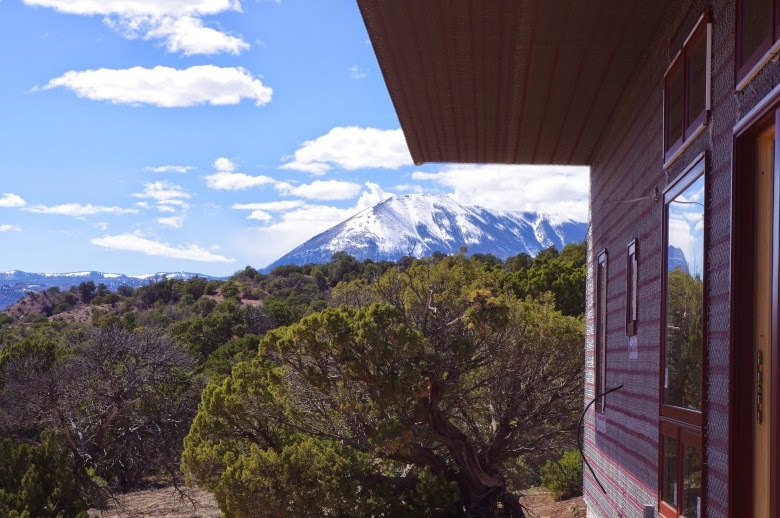 She and her husband are renting a place in the tiny town of Walsenburg, CO, with a population of 3,068, which still makes it the largest metropolitan area in Huerfano County. In her post Living in the Land of Relaxation she offers her impressions of small town living after years of residing in the city. But moving to this tiny town is not the half of it. The reason she's there is because she's building her own home even farther out into the wilderness, in the shadow of the Spanish Peaks. To see how it's going, journey over to her post Beautiful Snow and a Garage Door Too! I guarantee you'll be amazed at some of her photos. Meanwhile, Meryl Baer of Six Decades and Counting has crossed her own threshold in life. Get ready, because it's a big one! As much as she hates to admit it, she now eagerly drives into town in the late afternoon, heads to a restaurant and proceeds to patronize the ... early bird special! 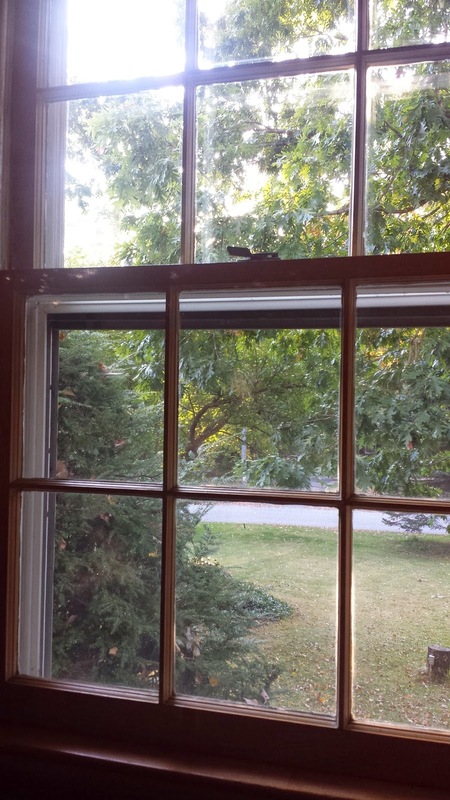 Check out her admission into this new phase of life in Confession of an Early Birder. Personally, I see nothing wrong in taking advantage of a cheap meal -- however you come by it -- but the real question is: Does she stuff those Sweet 'n Lo packets into her purse before she goes out the door to get home safely before dark? Now I move on from something we never expected we'd do, to something that I, at least, resolved never to do again. After struggling through several used cars in my early adulthood -- a Buick, a VW, a Saab -- I told myself I would never buy a used car again. So the years went by. I bought a brand new Ford Taurus, a Honda, another Saab (okay, everybody's allowed to repeat one mistake). And then, again, I needed a new car. But a new one seemed so expensive, and there was this great deal on a Volvo with less than 30,000 miles on it, and there was a one-year guarantee ... and (the salesman told me) it was only driven by a little old lady. On Sundays. To church. 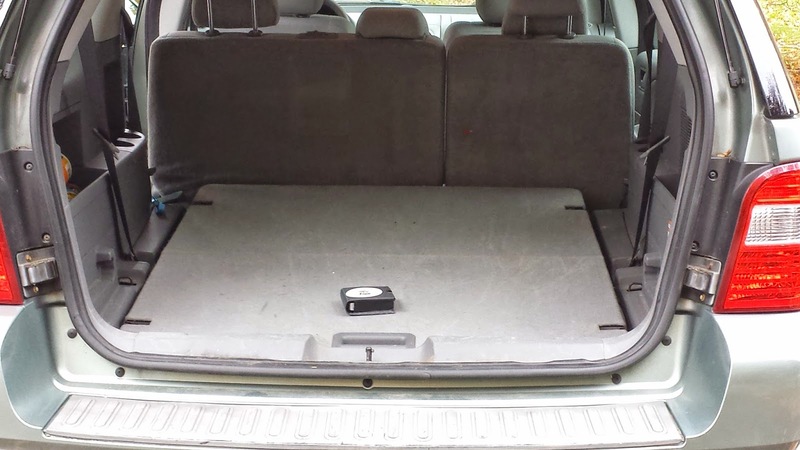 So I went ahead and bought a used 2004 Volvo. Then, within a few weeks, it was back at the dealer for a new transmission. Fortunately, it was covered by the warranty. Still, I spent a fortune on that car over the next several years -- until my daughter said she'd take it off my hands. She's now still driving that thing, closing in on 200,000 miles. And if what she tells me is true, she hasn't spent a dime on it in the last three years other than to change the oil. Go figure. Anyway, that's a long introduction to The Survive and Thrive Boomer Guide, where consumer journalist Rita R. Robison offers a parking lot full of the Best Used Cars for Every Budget, according to Consumer Reports. The review also includes a list warning us off the worst used cars. So if you're in the market, drive over to see the list. And by the way, Volvo doesn't make either the best or the worst list. Which leads me to believe, maybe it's not the car, but the driver, who determines how the car performs over the long haul. Finally, from Smart Living 365, we have some thoughts not about how cars perform, but how we ourselves perform in our own lives, and how much we create our own circumstances and our own futures. Says blogger Kathy Gottberg, "While I'll admit that it is empowering to think I influence my world, and easy to imagine that your reality can be very different from mine, obviously that doesn't mean I can fly just because I want to. So do we create our own reality? What does the statement even mean? Is it true? And if yes, how does that lead to a smart and happy life?" For some insights, if not the final answers, try going to The Truth Behind "You Create Your Own Reality." That's all from the Baby Boomer bloggers, except to say that B and I will be watching Downton Abbey tonight. It's the Season 5 finale, so maybe we'll find out what happens with ... well, you can watch on your own and enjoy it yourself.